Boley 8- Bit Foam Pixel Weapon set is super soft yet durable toy are the perfect party favor for you or your child's next birthday party/event! This is the perfect add on to your Minecraft Diamond Sword Collection. The set comes in a pack of 4 foam swords. Within the pack there is one pickaxe, one pirate sword, one dagger and one long sword. Each sword measures roughly 2 ft in length and close to 1" inch of foam to get you a nice solid grib on the weapon. EPIC BATTLE: Boley 8-Bit Foam Pixel Weapon Toy is super soft yet durable. They are the perfect party favor for you or your child's next birthday party/event offering hours of pretend play. Whether it is a Minecraft themed party or just a typical pool party, your epic battle awaits! LARGE SIZE: Check out our sizing picture to see just how long these foam swords are. They are not your typical 12- 18 inch sword, they are a whopping 2 feet in length! This toy definitely isn't getting lost in the house. DURABILITY: Our toys are built to withstand heavy play and are built from durable EVA foam, so you don't have to worry about fading colors and cracking. Our toys are built to last, with our 100% satisfaction guarantee attached! 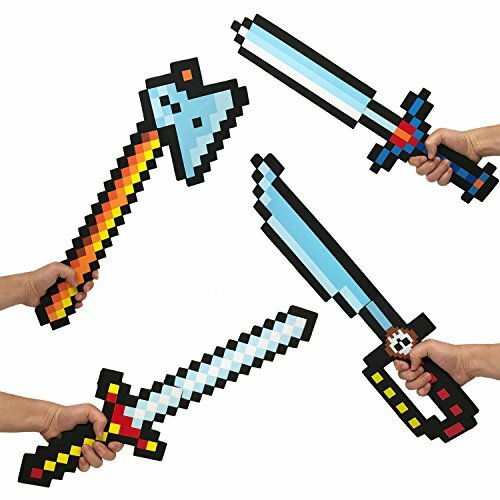 PARTY FAVORS AND GIFTS: Pixel weapons are great as fillers for gift packs, costume party invitations, or cosplay events. Who doesn't want to take home large foam pixel weapons that would strike fear in the hearts of foes? These make great party gift or giveaway gifts for social events! AGE: These toys are intended for kids ages 3 and up, or any age in which a kid can hold a sword. Boley is not held responsible for injuries resulting from sword fighting. Play responsibly! View More In Pretend Play. Colorful Vinyl Octopus Squirt Toy - Bath Toy - Party Favor! The Ultimate Tea Party Set for Toddlers, Preschool Age | Cute Wooden Play Food Dessert Stand & Tea Set, with Tea Kettle Pot, Cups & Saucers, Pastries to Slice & Serve | Buy the Bundle & Save!